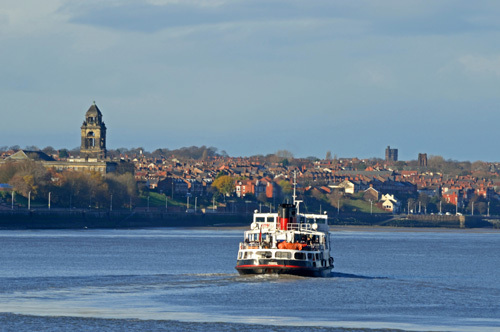 Earlier in the day I had taken the ferry from Liverpool's Pier Head across the Mersey to Seacombe on the Wirral Shore and walked the six kilometres to New Brighton via the riverside promenade. Now on the return, on board SNOWDROP, we've docked briefly at Woodside then headed south to about New Ferry before making a wide, leisurely turn back towards Pier Head. The short cruise is a great opportunity to take in the lie of the land on both sides of the river and contemplate the wealth of history associated with this murky, fast-flowing waterway. 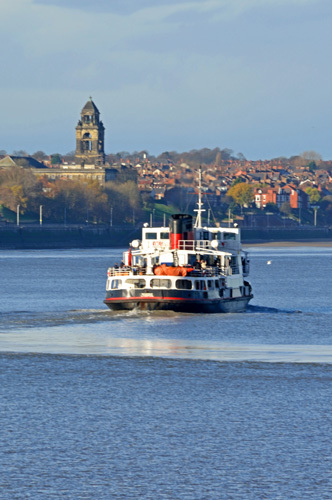 Ferries have operated across the Mersey since the twelfth century, when monks at the Benedictine Priory at Birkenhead charged a fee to row passengers from one side to the other - no mean feat when you consider that the river then was much wider than it is today. In the 850 years since then the ferries have progressed from row boats to fully-rigged sailing ships, to paddle-steamers then twin-screw steamers and finally the fleet of three modern diesel-powered little ships operating today. 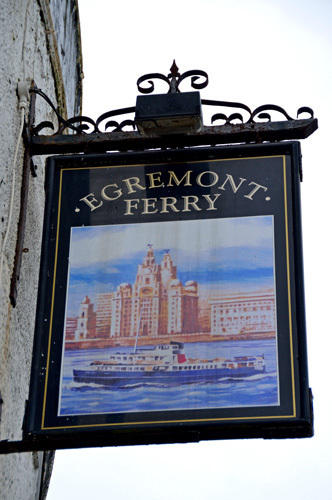 In 1914 two of the ferries were taken out of service and used as troop ships for a raid on the port of Zeebrugge in Belgium and in 1941 ferry services were suspended when German mines drifted into the Mersey from the Irish Sea. At the peak of their popularity in the 1950's the ferries carried almost 30 million passengers annually but by 1970 that number had fallen to just 7 million. 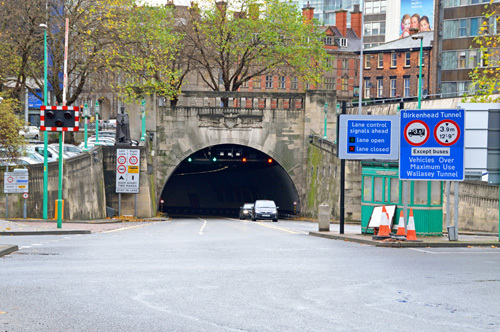 The Opening of the Kingsway Road Tunnel, the second tunnel under the Mersey, and the enhancement of rail services to the Wirral led to further declines in ferry patronage. 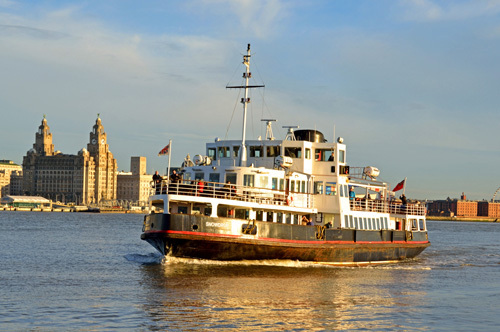 When Gerry and the Pacemakers sang about the Ferry Across The Mersey in 1965, the boats became an instant tourist attraction and Liverpool icon. 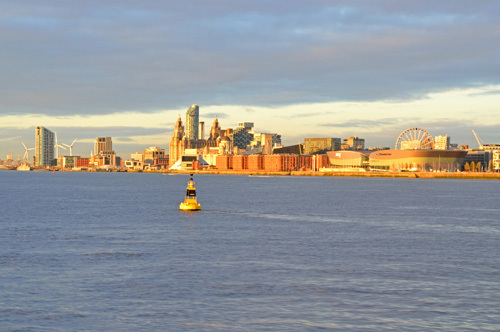 That's a trend that continues today and a trip across the Mersey is a must for visitors to this historic city. Back on the river and SNOWDROP is making good progress towards Pier Head against a fast flowing in-coming tide. Off to my right the late afternoon winter sun is shining brightly on the old and the new Liverpool as I reflect on some of the local history. In the short time I've been here I've learned that at one time 40% of all world trade passed through the Port of Liverpool and that in the period 1750 to 1807 nearly all the cities major merchants were slavers. Half of Liverpool's shipping activity engaged in the slave trade and transported about 1.5 million Africans across the Atlantic in chains. And a lot of Liverpool's history can be related back home to Melbourne. It was from Liverpool that the immigrant ship CATARAQUI departed for Melbourne on 20th April 1845. One hundred and six days later, as she neared her destination, CATARAQUI was slammed onto rocks on the west coast of King Island. In what remains Australia's worst ever maritime disaster, 400 of the 409 souls on board perished. And then on November 6th 1865, the last combatant unit of the Confederate States of America, the warship SHENANDOAH, steamed up the Mersey with her Confederate colors flying proudly and surrendered to the Captain of HMS DONEGAL. Just months earlier SHENANDOAH had been in dry-dock at Williamstown in Melbourne making repairs and recruiting crew before continuing to prey on Union shipping during the last months of the American Civil War. Wow, if the murky waters of the Mersey could speak what stories they might tell.